The European Parliament’s tax payer funded liberal group is hosting their annual congress in the Hungarian capital with the express intention of destabilising the democratically elected right-wing government. Belgian MEP Guy Verhofstadt said Hungary’s Prime Minister Viktor Orban is a “dictator” and “the problem of Europe” who deserves “sanction”. 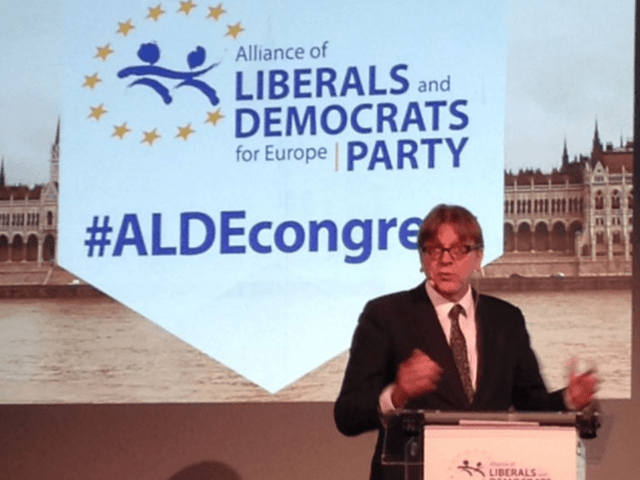 Other speakers – including the UK Liberal Democrat’s Catherine Bearder MEP – agreed with him at the meeting of the European Political Party for Liberal Democrat Values (ALDE) in Budapest. “It’s no coincidence that we are holding our annual congress in Budapest. Our presence is a clear ‘no’ to the illiberal state of Orban”, Mr. Verhofstadt explained in his speech on Friday afternoon. “This is why we are here. To say ‘no’”, confirmed Hungarian MP Gabor Fodor during a debate shortly after. “Why is [Mr. Orban] talking about family values, Christianity and the nation… and Hungarian culture?” asked Dutch MEP Sophie In ‘t Veld. The news will raise fresh questions about the use of European tax payer money to oppose democratically elected governments. The last similar example is when the EU apparatchiks and tax payer funded groups agitated against another Viktor – Former President Yanukovych – eventually leading to his topple in an EU-backed coup. 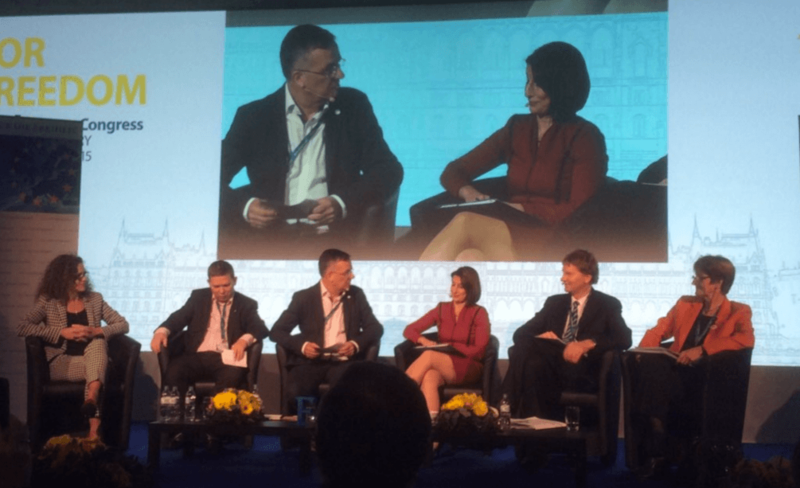 One debate at the three day event, is called “An alternative for Hungary – the Liberal way forward”. It was introduced as a discussion addressing the “problems” in Hungary and how to push an “alternative” on the electorate. “Orban is Europe’s moral crisis. Instead of defending our European values, we tolerate him”, said Mr. Verhofstadt, who served as Belgian Prime Minister between 1999 and 2008. He has previously attacked UK Independence Party (UKIP) leader Nigel Farage. Shortly before the debate on how to enforce liberalism on Hungary, Mr. Verhofstadt called Mr. Orban and his democratic government a “dictatorship of majority”. Mr. Orban won a thumping parliamentary majority in Hungary’s national elections in 2014. He claimed the Prime Minister had double standards and flouted “European Union values”. “There is no room for illiberal democracies in Europe”, he added, in a sure sign EU resources are being used to crush conservatism across the continent. He demanded Hungary face “sanctions” for implementing the democratic will of the people. During the debate they discussed the “mechanism” to enforce “human rights” and “diversity” on nations like Hungary. British Liberal Democrat and former MP Graham Watson chimed with the sentiment in his speech: “We know where Orban’s illiberal state will lead – back to the horrors of the past”, he said. MP Zsuzsanna Szelenyi said the fence that Mr. Orban has built along Hungary’s southern boarder is “pointless” and “symbolic”, even though it has been wildly successful at stemming the unchecked flow of migrants from the Middle East, and increased Mr. Orban’s popularity with voters even further following construction. Another speaker said Mr. Orban is “xenophobic” and “racist”, while Hungarian MP Zoltan Kesz inexplicably said he is the “useful idiot of the Islamic State”.